The Philly Block Project is a yearlong, socially engaged collaboration that has provided a visual narrative of South Kensington's past and present through photographs. The yearlong Philly Block Project, created by the Philadelphia Photo Arts Center (PPAC), provides a look into South Kensington's past and present through photographs. As the project begins to reach its end, the PPAC will unveil a new exhibit in the series. Beginning on Sept. 8, the PPAC Gallery will showcase "The Block." Artists collaborating on the photo exhibition include Hank Willis Thomas, Wyatt Gallery, Lisa Fairstein, Hiroyuki Ito and Will Steacy. Five hundred photographs will cover the walls of the gallery, beginning with floor-to-ceiling images of neighborhood row homes. As attendees make their way through the exhibit, the photographs will become more intimate. 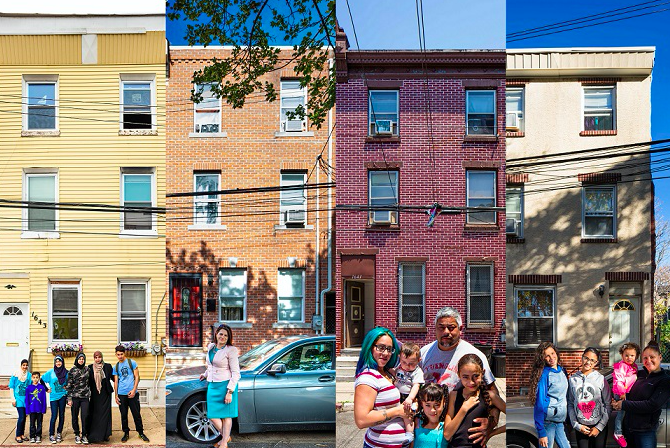 Smaller portraits of residents will showcase the inhabitants of Kensington. "Older residents relax on lawn chairs, while young children rocket down the driveway on pogo sticks," a press release on the exhibition states. "While one neighbor shows love through his 'Kenzo' tattoo, another sports a 'DAD' ring alongside a wallet-sized image of his daughter." The photographs will remain in the gallery through the end of November. To celebrate the unveiling of a new exhibit, the PPAC will host a block party on Sept. 10. The day will feature live music, games, art workshops (such as mural painting and silk screening) and a few carnival rides. The public party was made possible through a $25,000 crowdfunding campaign.